849 Kelly Creek Road – Kelly Creek Lodge is the ideal home for those seeking the Montana lifestyle while desiring luxuries and amenities worthy of a world-class resort. Meticulously designed and built, using the finest natural materials, the home is sheltered by towering groves of evergreens and aspens while enjoying breathtaking views of the Bridger Mountains and sun-drenched meadows teeming with wildlife. Neighboring Kelly Creek and the dense forests covering the surrounding foothills and mountains, is the ideal habitat for elk, deer, coyotes, foxes, moose, and brown bears. Birds fill the skies while wildflowers carpet the meadows. Bozeman, Montana is heralded for its Big Sky, open views, neighboring mountains, pure water and air, numerous trail systems, year-round outdoor activities, sense of community with its University and abundance of arts, culture, celebrations, and also how quickly one can escape into rugged wilderness minutes from town. The Bridger Mountains, Green Mountain, and Bang Tails create the majestic landscape to the North and East of Bozeman, with towering mountains, lush valley canyons, and undulating foothills. Kelly Canyon, like further-east Jackson Creek, is a gorgeous valley connecting 1-90 east of Bozeman with Bridger Canyon. Kelly Creek Road is in the middle of the canyon’s valley, off the main road and nestled into the forested skirts of the mountains. Within this ideal location and setting, the home’s architecture is an ode to traditional lodge design, balanced from one end to the other with symmetrical gables and dormers, arched 2-story-high windows, and recessed covered porches with stone exterior walls. The rich redwood lap siding exterior is accented with sage-forest green trim as well as river rock stone at the home’s front door covered porch and side-door covered porch. The 3-car garage features wood doors with beefy decorative metal hinges. Perennial flowers beds rim the home and the cement walkway to the front door. 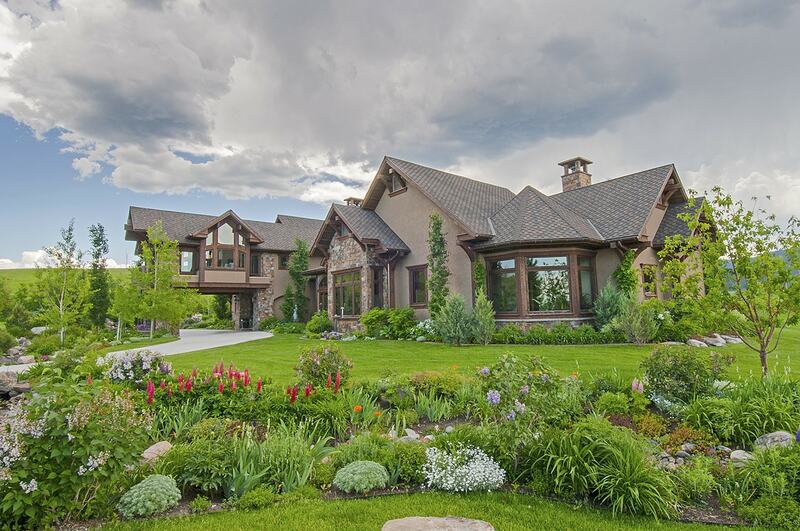 The lawns, with underground sprinklers, transition to the meadows and forests with interspersed groupings of towering trees that open and frame the views of the full-front-range of the Bridger Mountains. View the 849 Kelly Creek Road Listing HERE. Consistency and balance are a hallmark of this home, beginning with the welcoming covered front porch and oversized glass front door with its two side glass windows. The door and windows are surrounded with wood that has been painted black then finished in a lengthy process of rubbing and distressing it to a timeless, softened quality. This same technique is utilized elsewhere in the home, beginning with the risers and railings of the grand, open staircase to the second-floor bedroom suites located in the front foyer. While the all-suites, 4-bedroom, 6,830 square foot home is large, it is also cozy, comfortable, and inviting, with multiple areas for family and friends to congregate and spaces for a person to enjoy solitude. Very much built for Montana, the public rooms have reverse-sawn wood flooring stained a deep walnut brown, plaster walls in a neutral, pale and soft ocher-mustard color, timber and stone accents, and glass doors and windows exposing big views of the glorious setting. The woodworking throughout the home is master-craftsman-quality, from the custom cherry wood kitchen cabinets to the furniture-like bathroom vanities, and very impressive custom bar in the family/game room. The stage is set the moment you enter the wide and spacious front hall foyer, which extends from the more formal living room on the north wing to the French doors of the south wing Master suite and hall to the east-facing kitchen, creating an easy circular floor plan. Two-story-high vaulted ceilings with upper and lower windows flood the space with natural light. The foyer’s exterior wall, with its windows and glass door, is a dramatic deep sienna red, adding warmth and mystery. The open staircase and banister for the hallway connecting the 3 upper floor bedroom suites is grand and occupies the central length of the foyer. The front entry’s 2-story-high vaulted ceiling continues into the formal living room, with west windows to the Bridger Mountains and a north view of the woods. The same large, rounded river rock used for exterior accent walls create the living room’s and adjacent den’s (or dining room) gas fireplaces. The sizable log mantle above the fireplace, an imposing and conversational piece moose antler chandelier, the timber detailing, along with the views, add to the sense of places you know are in an alpine setting in the heart and soul of Montana. The adjoining den is a wonderful place to relax while still being a part of the kitchen or living room activity. The room could also serve as a dining room for those wanting an additional place to eat other than the farmhouse kitchen or the big outside mahogany wood deck. Glass doors open to the deck from both the den and kitchen, creating yet another circular flow for people to move from space to space with ease. The kitchen, on the east side of the home and overlooking sunny meadows, undulating hills, and mountains, and thick forests, has many special touches that imbue it with its farmhouse feel, while still being state-of-the-art. The custom cabinetry includes an old fashioned plate display rack and furniture detailing such as hand-turned dowel legs supporting the granite two-tiered island with bar seating. The farm-style sink with recessed bay windows is a perfect spot to watch the neighborhood moose with her calf in the backyard. The counter has a backsplash of Arts and Crafts tile with decorative acorn and pine motif. Chefs will appreciate the 6-burner cooktop, double wall ovens, Sub-Zero refrigerator, beverage refrigerator, and the 3 large pantries, each with double wood doors. The informal dining area in the kitchen allows for large gatherings, and the glass doors to the sizable entertaining decks–both covered and open– assures that al fresco dining is simple. The covered deck, with its wood burning fireplace with slate tile surround and an art tile mosaic of an etched bear rambling through the woods, extends the season for enjoying the backyard. It is essentially an additional room with multiple spaces for furniture and games such as ping pong. It’s easy to grill for a crowd with the powerful exhaust hood over the grill and lots of room dining tables and sitting areas. Landscaping boulders surrounding parts of the deck and terracing the hillside create fun places to sit and to explore. The carpeted Master Suite, on the Southside of the home, has the same two-story vaulted and angled ceiling as the grand entry hall and formal living room. A double-story arched window, matching the living room’s, opens up the western views of the Bridger’s. The spa-like bathroom and walk-in double closets include all the touches and materials one hopes for, including travertine marble, unique granite that has a tree-like pattern in the veining, custom double vanities resembling fine furniture, and windows overlooking nature’s beauty. The glass-side shower is fit for a king. The residence’s upper floor, accessible from the grand staircase, is comprised of three carpeted and spacious bedroom suites, each with full baths, and finished to the same high level utilized throughout the entire home. The first bedroom was the home’s original master suite prior to creating the new main floor master. All three bedrooms enjoy wonderful views, natural light, and include large closets. The home’s lower, walk-out level, is all about having fun. For starters, there’s the big screen theater, modeled after a real theater with tiered seating ensuring you can watch movies in comfort with unobstructed views. Continue your entertainment by going to the Game Room and Bar, at the end of the hall. A pot belly stove warms the space, while glass doors open to the lawns. There is plenty of space for the pool table and quiet seating away from the activities to watch TV or have a conversation. The centerpiece of this amenity-filled, very spacious room is the custom bar, with double counters of polished wood, a mirrored back wall framed with old fashioned glass-fronted double-door cabinets, furniture-style cabinetry, a copper bar sink, wine racks, beverage refrigerator, microwave, and a dishwasher. People of all ages will enjoy sitting at the bar and feeling like they have stepped back in time. The lodge’s “Back of the House” is as well appointed as the public and private spaces. A wide, main-floor, back foyer connects the den to the laundry room, mud room with generous coat closets, stairs to the 2nd upper level space, a powder room , and the 3-car attached, heated, garage which includes an extra-large bay for big trucks or a boat, a dog bath, built-in storage, and a workshop. The back hall has convenient doors to both its front covered porch and to a patio connecting to the back entertaining deck. The carpeted “Bonus Room” above the garage is finished and ready to be utilized in any number of ways. Large enough to create a caretaker’s or guest quarters, the room is bathed in natural light from its 3 dormer-style windows facing the Bridger Mountains. The vaulted and pitched ceiling has timber beam detailing, and the plaster walls are trimmed with wood. The home is in move-in condition and must be seen to be fully appreciated as there are too many details and stunning views to ever fully describe.